Over the last year there has been a plan developed to prepare for a Mass Casualty Incident (MCI) should it occur anywhere in Hamilton County. This plan was developed in cooperation with Hamilton County Fire and EMS agencies and with the Cincinnati Fire Departments. 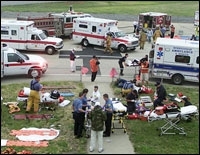 This plan has been based off of the Mass Casualty Incident Plan currently in place at the Cincinnati/ Northern Kentucky International Airport and is tested every three years. Prior to this time there has not been a comprehensive plan for a county wide joint response. This plan use services and agencies from within Hamilton County and is supported by agencies in Butler, Clermont and Warren Counties in Ohio, Boone, Kenton and Campbell Counties in Kentucky as well as Dearborn County Indiana.